When we’re young, we write stories and draw pictures fearlessly. We don’t worry about grammar or spelling or perfect shapes. But somewhere along the way, we grow up, and many of us become more self-conscious about writing and art. 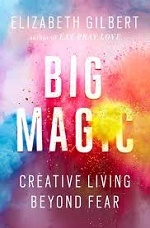 “Big Magic: Creative Living Beyond Fear” (2015) by author Elizabeth Gilbert is a gift to all of us that affirms the creativity within us and our right to be creative. Conversational, engaging, and often humorous, with a dose of reality, “Big Magic” reflects on the five essential ingredients for creativity, which are the same for everyone: courage, enchantment, permission, persistence, and trust. Courage. “Do you have the courage to bring forth the treasures that are hidden within you? Can you live a life driven by curiosity, not fear?” Gilbert reveals her own fearful childhood, her mother’s strategy to make her do the things she feared, and her realization that fear is boring. She tells us that when we accept that fear is a part of us, when we don’t give in to it but don’t reject it either, fear will relax. Enchantment. “I believe the creative process is both magical and magic.” If an idea comes to you, you can say no. If you say yes, then commit to it and be fully invested in it. If your idea no longer speaks to you, it’s okay to let it go and catch the next idea. No one owns ideas, so accept that there are often “multiple discoveries” with wonder, not bitterness. Permission. “You do not need anybody’s permission to live a creative life.” When you follow your curiosity, you can fold your dreams into your everyday life. Acknowledge that “Most things have already been done – but they have not yet been done by you.” The central paradox about creativity: art matters (it uplifts us and adds meaning to our lives) and art doesn’t matter (we must be able to let go of our ego and release it into the wild, because other people will have their own responses to your work). Trust. Trust that your work loves you as much as you love it. You don’t need to suffer to be creative. Instead of being a martyr for art, be a trickster – be charming and subversive, like Bugs Bunny. “Interesting outcomes, after all, are just awful outcomes with the volume of drama turned way down.” You don’t have to follow your passion – you just have to follow your curiosity. Don’t dwell on your failures, move on, and stay busy. Interestingly, Gilbert believes that you create something that is yours; but once you share it, it also belongs to other people, who add their own meaning to your art. In this way, art becomes not just an expression of yourself, but a conversation between you and others. Now that you’ve read about Big Magic, you can make some Big Magic of your own. Gilbert’s website offers a “Big Magic Inspiration Guide” to help you tap into your creativity. This entry was posted on May 7, 2016 at 5:00 am and is filed under Book Reviews. You can subscribe via RSS 2.0 feed to this post's comments.